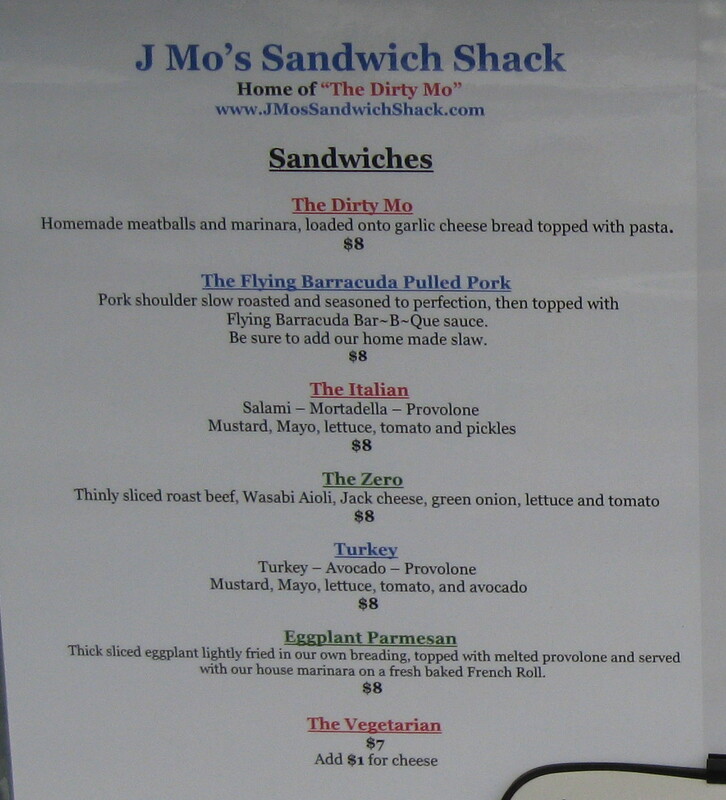 J Mo's Sandwich Shack is located at the Cartlandia food pod in Portland, Oregon. Jason "Mo" Moreno is the owner here. He's been cooking since he was 15, and really developed an immense passion for it. After selling insurance for a while, Mo finally decided to open up his food cart in mid-June. 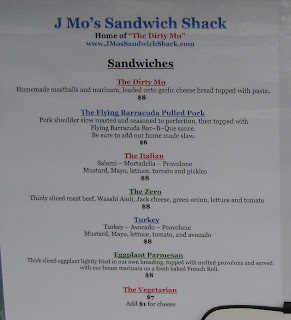 Mo clearly makes it known his "Dirty Mo" sandwich ($8) is his signature item. It's basically spaghetti and marinara inside cheesy garlic bread, with an option to add housemade meatballs (yeah, take that option!). Admittedly, it's a carbfest that the panda would have to prepare for. Gotta stuff a blanket in the back seat of the car for the impending food coma. UPDATED 7/11/13 with some Dirty 'Mo pictures! This time, I opted for the Flying Barracuda Pulled Pork sandwich ($8). The pork is slow roasted for 6-8 hours, then mixed with his business partner's Flying Barracuda honey BBQ sauce. Mo makes his own slaw, a runny mayo shredded cabbage concoction that possesses a slight vinegary kick. Generous portions of pulled pork and slaw are added to this healthy-sized sandwich roll. Mo gets all of his bread from An Xuyen almost every day (except Mondays, when the bakery's closed). First of all, this sandwich is absolute money. The pork was incredibly tender, tearing off with little to no effort and melting in my mouth. The crunchy slaw complements the pork and the BBQ sauce. I found it amazing that the bread held it all! I have no idea how An Xuyen makes their bread, but you can bet the farm that I'm heading there in the future. Amazingly soft bread, stretching to its maximum if need be to hold everything in. I told Mo that he'd probably have to give out forks for his sandwiches because it's such a bear to handle. I for one certainly didn't mind becoming one with the sandwich in public. And hey, isn't it an amusing spectacle to see a panda wrestle with a sandwich? Trust me, the panda wins every time. Mo told me that you can also get a meatball sandwich for $8. I got to try a meatball sample -- of course, Mo makes his own -- and nodded in approval. Hearty, juicy, savory, and a bit of sweet from the tomato sauce. Extremely comforting. The actual meatballs are a bit larger than the sample I received! 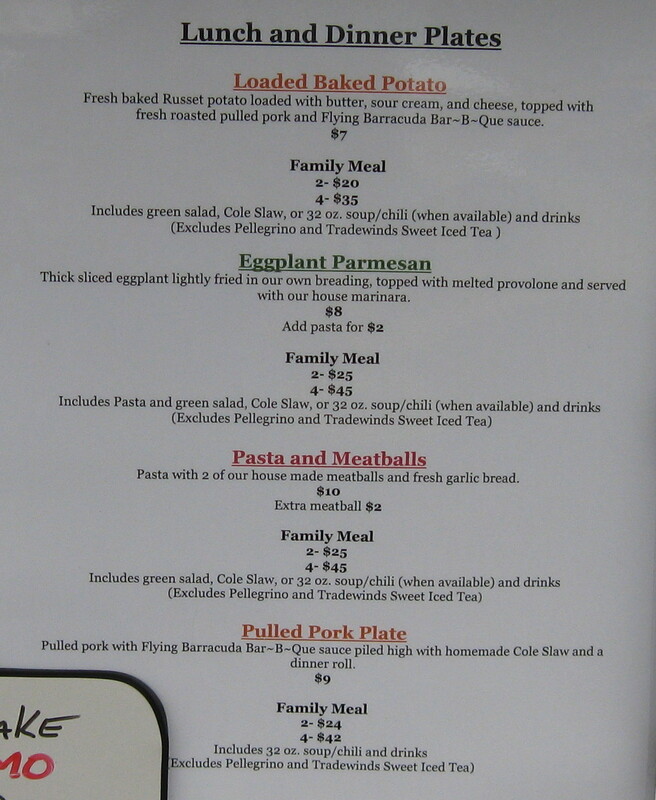 Respected people like Steven Shomler (Portland Food Cart Adventures) and Brett Burmeister (Food Carts Portland) have raved about Mo's Italian sandwich ($8). It's really a cart where you can't go wrong. Mo takes his handful of sandwich options and delivers on every single one. Best of all, you'll get your money's worth on the portion size. I think the only thing missing is a real spicy option.